Winrock event promotes lending, says access to credit is key. Solar water pumps can greatly boost incomes by improving yields and allowing farmers to grow high-value horticulture crops during the dry season. 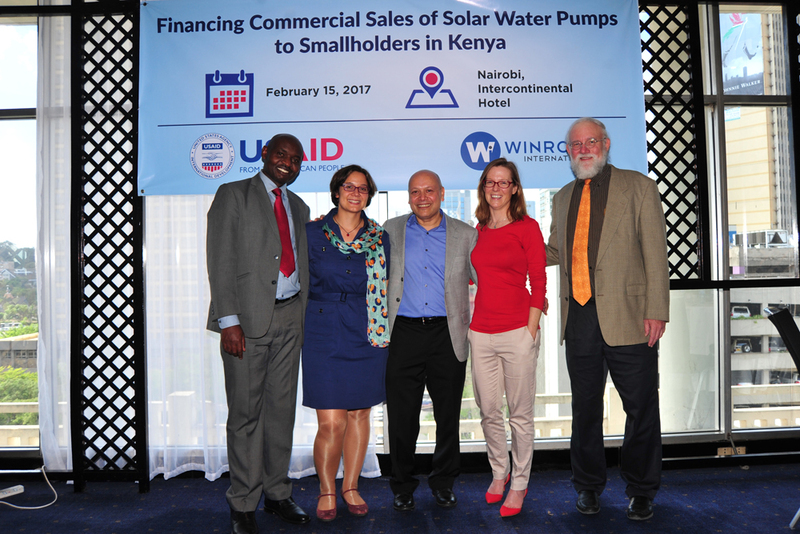 On February 15, Winrock hosted a convening in Nairobi to discuss smallholder financing for these pumps. The Winrock team. From Left, Bernard Ngetich, Genia Sokolova, Bikash Pandey, Jenn Holthaus and Robert Foster. Through the USAID/Kenya Smallholder Solar Irrigation project, Winrock has spent two years working to increase solar pump sales to smallholders. We collaborated closely with the USAID/Kenya Agricultural Value Chain Enterprises (KAVES) project, which is connecting thousands of small farmers to key value chains, including horticulture. Together we have demonstrated solar pumps to more than 16,000 farmers. Access to credit is a key bottleneck, and Winrock is now focusing on scaling up solar pump lending. We originally planned for 40 participants, but we had to get a bigger room at the last minute when 76 people registered for the event! We were pleased with the huge turnout from the Kenyan finance sector, which included representatives from seven Kenyan financial institutions and several international impact investors. Bernard Ngetich, KSSI Project Manager, shares how solar water pumps boost incomes of farmers by increasing irrigable land and eliminating diesel fuel costs. The main message of the day, echoed by Winrock, KAVES, farmers and agricultural aggregators, was to question why it’s so difficult for smallholders to finance solar water pumps, given that they increase farmer incomes. This message was a clarion call to the Kenyan financial sector that solar pumps have arrived, demand is strong, and they need to get in the game by offering solar pump loans. Winrock’s three pilot finance partners — Juhudi Kilimo, EcoSmart and KUSCCO — each made presentations about their new solar pump loan products. We had planned for four solar pump retailers to set up their pumps outside the hotel for the event. So when we woke up to overcast skies that morning we were nervous — after all, solar pumps don’t pump without sun! But the skies cleared just in time, and it was awesome to see crowds gathering around each of the pumps, which currently range from US $350 to US $1,500 depending on the power needed to pump the water. 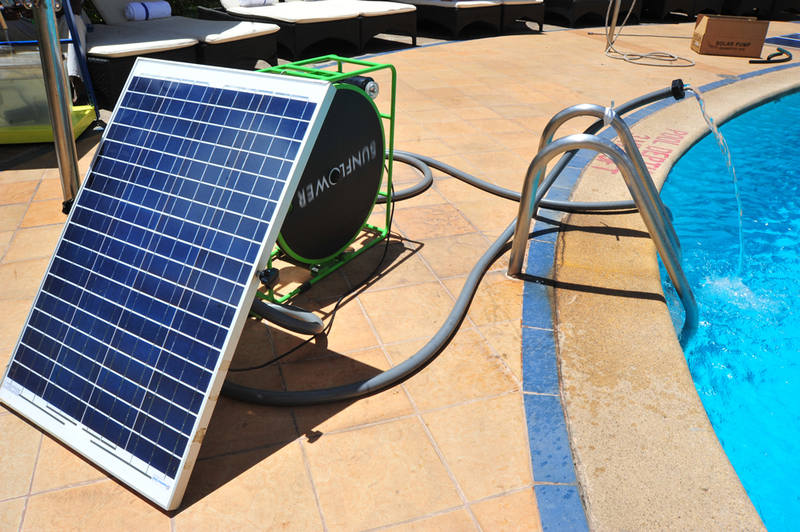 Four solar water pumps were demonstrated pool-side. This Futurepump Sunflower sells for about 65,000 KES or $550 USD. In the afternoon we gave participants a chance to connect during business-to-business meetings. Our microfinance and solar water pump retailer partners were able to talk with impact investors and larger commercial banks about possible partnerships. In the days after the event four new financial institutions contacted us with requests to partner on creating solar water pump loan products. We will start the second phase of the work this summer, and we look forward to scaling up lending with these pioneers. As we celebrate the International Women’s Day, Winrock International salutes women smallholders all over the world. 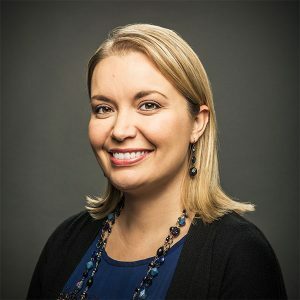 DeAnn McGrew, Winrock’s director of agriculture and volunteer programs, talks about a time when everything came together to help women in Kenya — the USAID-funded Partnership for Safe Poultry in Kenya (PSPK) program. 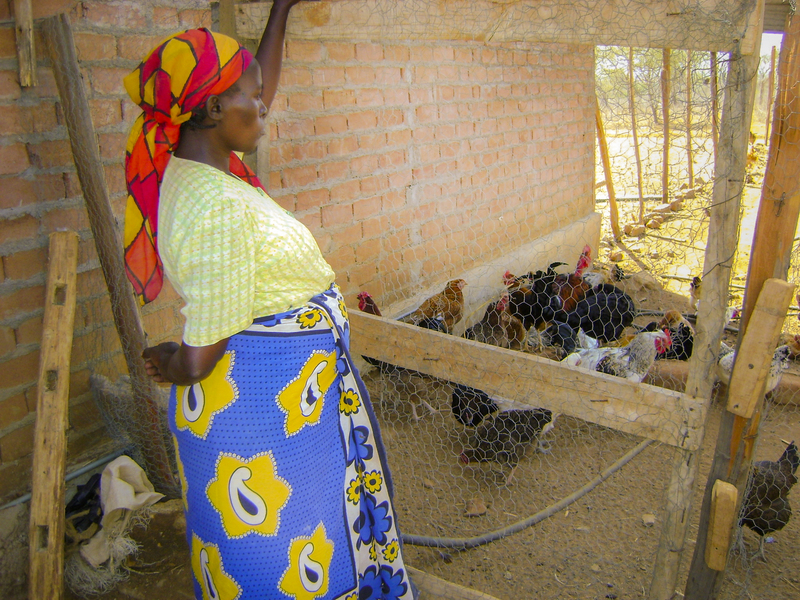 Tell us about the Partnership for Safe Poultry in Kenya (PSPK) program. DM: PSPK’s goal was to promote safe poultry production and create marketing systems that generate higher incomes and improve nutrition for smallholder families. 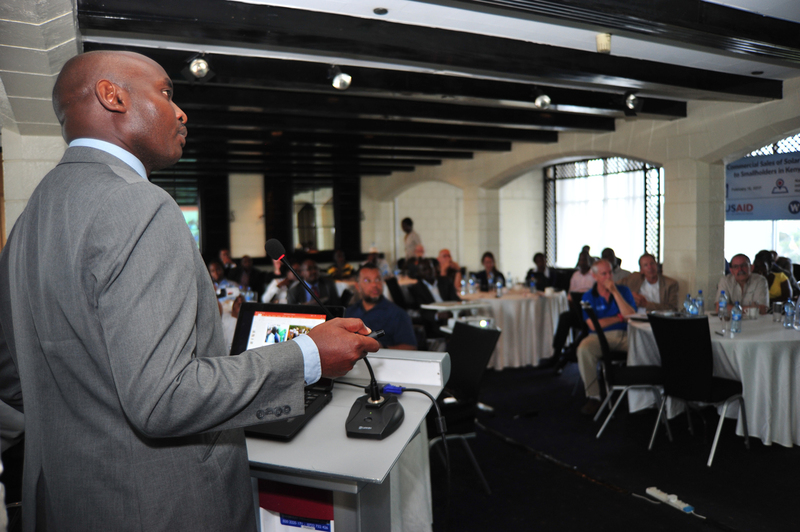 It aimed to move the Kenyan smallholder poultry sector to higher levels of efficiency and productivity. PSPK’s approach was to link poultry sector stakeholders with experienced experts from the U.S. and East Africa. These experts donated their time to the project as Farmer-to-Farmer volunteers and provided direct technical assistance to farmers. The impetus for this project originally came from an avian influenza outbreak in the mid-2000s. We were addressing the concerns around this health issue by showing women and smallholders that there was an economic incentive to put in place the biosecurity measures that would prevent disease. We told them, this is good for your health and good for your flock, but there is also a financial benefit to doing it this way. How big a part did women play in the PSPK project? DM: Of the 1,572 people trained directly by PSPK volunteers, 58 percent were women. As a result of the training, technical assistance and links to financing PSPK provided, several women established or expanded their poultry businesses and others expanded into other businesses, including the provision of vaccines and other inputs for other poultry farmers. 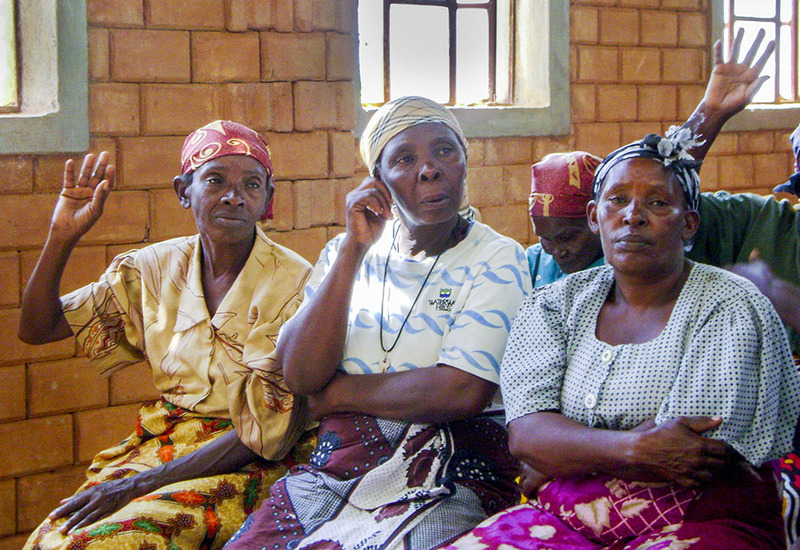 How did this project empower women? DM: It gave them ownership over their livelihoods with respect to livestock, to poultry. In Kenya, poultry was always considered women’s work because it was part of the household, the backyard flock, and wasn’t seen as something having an economic benefit. It was approached as a savings account — yes, you might get some eggs from your chickens but really they were for women to be able to sell for slaughter when they needed school fees. It was almost like taking a withdrawal from a savings account. We helped the women move to more of a commercial smallholder mindset, to help them see that raising poultry actually puts cash in their pockets and gives them control over productive resources for their households — and there was a lot of empowerment that came along with that. What did women do with their newfound income? DM: Most of the time they invested the money in their families — buying school uniforms or helping family members with loans, that sort of thing. In many cases, they used the proceeds to invest in their own small, nonfarm businesses. Many of them were seamstresses, so they invested in the fabrics they needed to sew dresses or shirts or pants. What was notable for them was that it was money in their pockets they’d never had before. They didn’t have to ask their husband permission to spend it. It was within their sphere of influence. Alice Pius Makau from the Kyemole Poultry Keepers Group told us that she wasn’t afraid of her children sleeping hungry anymore, because she had enough food for them to eat. “The money I get from chicken sales helps me to buy the food that I do not grow on the farm. I also have a constant supply of meat and eggs for my family’s protein nutrition,” she said. And Selesia Abolo, of the Star Ladies Women’s Poultry Group, said that earning an income from chicken lessened the money-related tensions in her family. “Now we are able to manage through tough times,” she said. Were you anticipating these kinds of transformations? DM: We knew that women were the ones working in the poultry sector, especially on the production side. But I don’t think we anticipated the significance of the impact. You mentioned the importance of volunteers on PSPK. How did they fit into the project? DM: PSPK was modeled after the Farmer-to-Farmer program, which brings U.S.-based volunteer experts to Kenya and other countries to provide technical assistance. In this case, volunteers worked on both the production and biosecurity sides, on feed formulation and development, processing and marketing throughout the value chain of indigenous smallholder poultry. What was unique about this project was that in many cases we were pairing those volunteers with local volunteers to build capacity, so pairing a U.S. volunteer in, say, biosecurity, with a local volunteer who was working with government extension to build the capacity of the smallholders. We also had a branding assignment. One of the things that was done in the very beginning was to look at consumer preferences for chicken. We learned that a lot of Kenyans preferred the smallholder indigenous poultry over the industrialized broiler that you would get at a supermarket. It was because of the traditional style of Kenyan cooking; the bird held up longer in a soup or stew. But backyard poultry producers were the most negatively impacted by the avian influenza. Once people started eating chicken again they felt more comfortable getting chicken at a commercial supermarket, as opposed to going back to the commercial indigenous model, because they were concerned that the biosecurity norms were not in place to make sure that the indigenous bird was a safe product. Building off those consumer preferences we helped create brand recognition for poultry produced in a safe way. We brought in a U.S. volunteer to work with a team of local student volunteers from a university in Kenya to develop logos and branding strategies for some of these small businesses. Was this a typical Winrock project? DM: The principles we were applying in this project are ones we’ve done throughout the years in our larger livestock projects. It’s working throughout the value chain and trying to figure out where the constraints are. Are they in production? In feed? In animal health? In processing, marketing, packaging or branding? And trying to address those issues wherever they exist in the value chain but doing so through commercialization and with resilience in mind. We demonstrated that if you invested a little bit more and followed biosafety protocols (making sure there’s a foot bath to wash your feet when you’re going into and out of production areas, for example), you were increasing resilience in two ways. One, you were putting physical safety measures in place to prevent avian flu outbreaks from occurring in your flock. And two, by producing commercially and turning the product over every few months you were continually putting money in the bank and creating resilience. Resilience means diversification, it means commercialization, it means reducing the impact of shocks for smallholders. Those are things that Winrock has experience doing with livestock around the world, which also played out in Kenya.